A regional publisher’s new £25m printing press received Royal approval when it was officially opened by Prince Charles and Camilla. 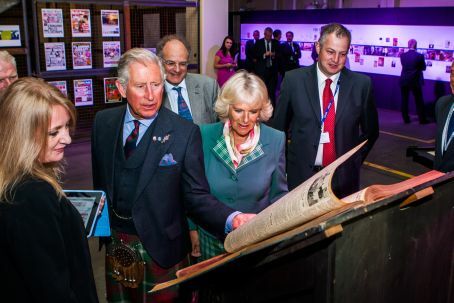 DC Thomson’s new facility was opened by the couple, who are known in Scotland as the Duke and Duchess of Rothesay, as they visited the publisher’s Dundee headquarters. The new printing press has been installed as part of a £25m refurbishment of the existing print plant at Kingsway East and will publish the company’s newspapers including The Courier, Dundee Evening Telegraph and The Sunday Post. The publisher’s titles in Aberdeen, which include the Press and Journal and Aberdeen Evening Express, will also be printed there after the closure of the city’s print plant earlier this year. The Royal couple visit DC Thomson's headquarters. The Duke and Duchess are making guest appearances in a special VIP edition of the Beano this week, also owned by DC Thomson, to mark the opening of the printing press by them. His Royal Highness stars in The Bash Street Kids comic strip where educates them on healthy eating after a school dinner food fight, while Her Royal Highness appears in a Dennis the Menace and Gnasher strip, visiting Beanotown to open the new school library and highlighting the importance of reading. In an article in The Courier about the new print facility, DC Thomson chairman Andrew F. Thomson, said: “We were delighted to welcome The Duke and Duchess of Rothesay to our Kingsway plant. “Their Royal Highnesses toured the presses and met with staff members from our publishing business, in particular production. “We are investing significant sums in publishing and we’re proud to be investing in the future of print. The Royal couple were greeted by DC Thomson staff members waving Beano-themed flags as they arrived at the company’s headquarters and were welcomed by Dundee’s Lord Provost Bob Duncan and members of the Thomson family. Prince Charles started the new printing press and the Royal couple also took a tour around an exhibition of the company’s history and its business interests. £25m on new print equipment! Are they mad? Talk about throwing good money after bad. There’s loads of capacity around and they chuck £25m at print gear.